Join Us Today for Family Dining! Craving the bold flavors of authentic Chinese food? Then come to China Delight Restaurant! 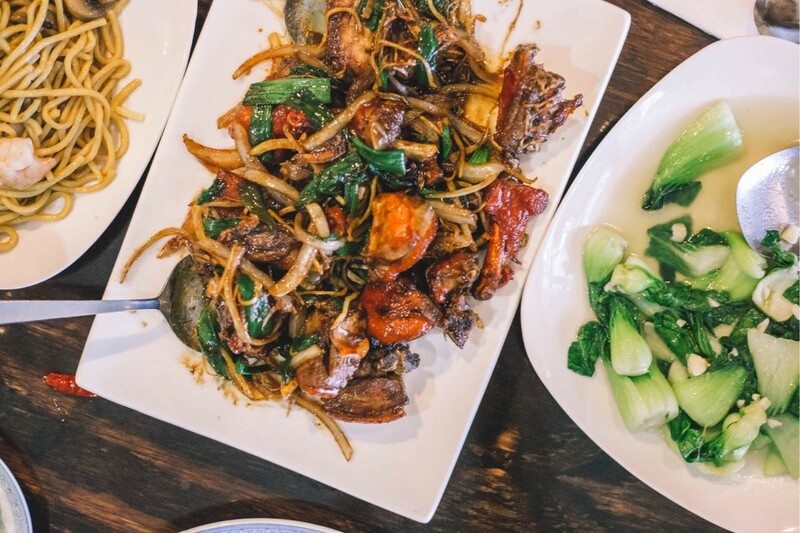 Whether you prefer Hunan, Szechwan or Cantonese, our talented chefs will create authentic Chinese cuisine to your liking using fresh ingredients and traditional Chinese recipes. We serve small and large entrees all day long at great prices so mix and match to your heart’s content. 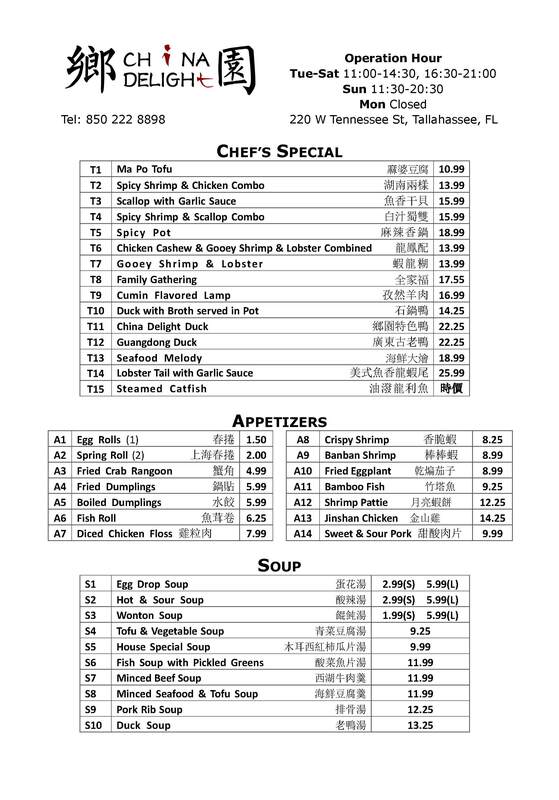 Visit one of the best authentic Chinese Restaurants in the Tallahassee, FL area today! Our experienced chef would like to share the best Chinese cuisine with our customers. At our authentic Chinese restaurant, we offer takeout and family dining service with very reasonable prices. We offer a variety of choices for our customers and hope that the customers will enjoy the delicious food and outstanding service! We are conveniently located on W. Tennessee Street- close to downtown and Florida State University. 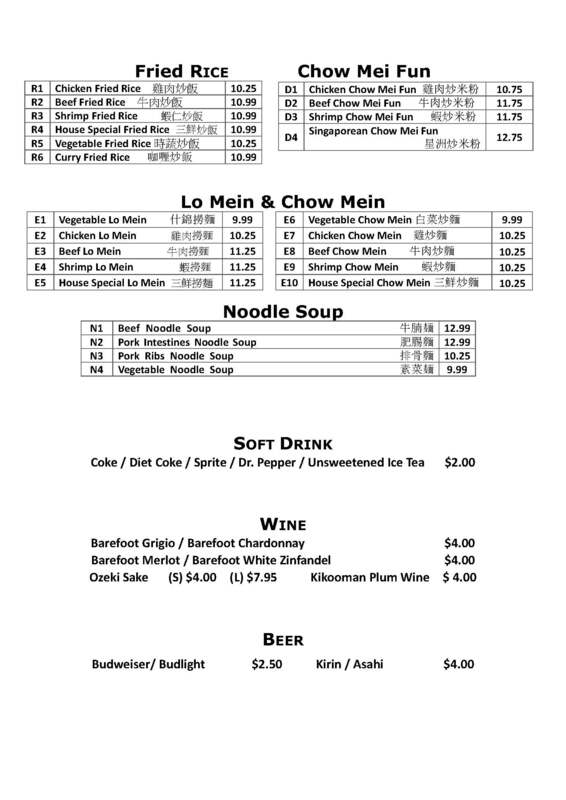 Come in on your lunch break and enjoy many of our great Chinese dishes! 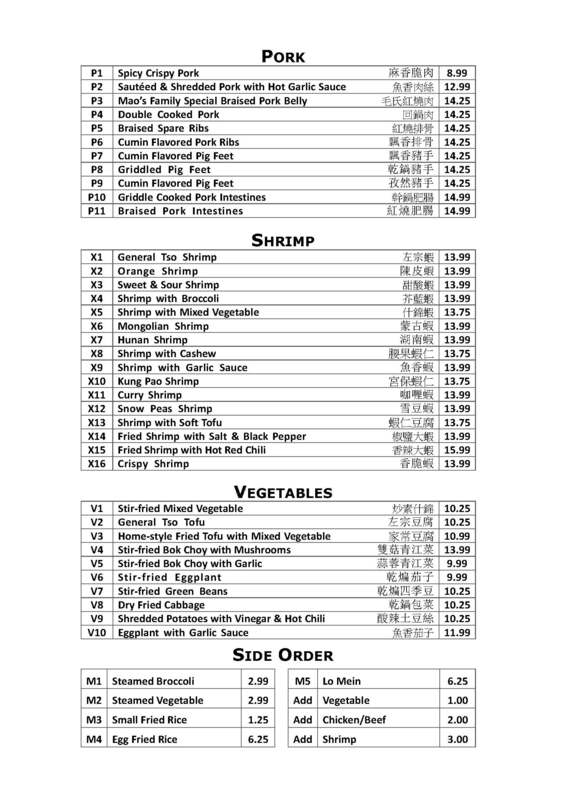 We have been serving the Tallahassee, FL area with great Chinese dishes for over twenty-four years and are a favorite among many of the locals. Our entire menu is served fresh and hot! Our signature dishes include Peking Duck (THE best in town), Beef with Orange Sauce, and Sesame Chicken. We provide our guests with a relaxing and comfortable atmosphere and provide a convenient location. 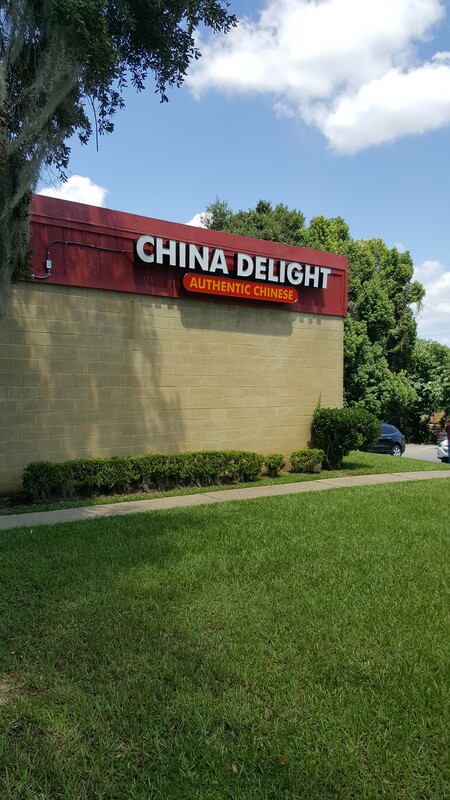 Whether you are in the mood for a chicken, pork, beef, Peking Duck, or a vegetarian entrée, China Delight has something for everyone! We have so many choices to choose from- from spicy Chinese dishes such as Kung Pao Chicken to a milder choice such as Beef with Broccoli. We also offer Bubble Milk Tea with Tapioca Pearl. Choose from Black, Mango, Coconut, Strawberry, Green Apple, Honeydew, or Almond flavors at our takeout restaurants. Stop by our convenient location today and try one of our authentic Chinese restaurants! We offer fast and friendly service for our lunch hours to accommodate business goers who still enjoy a sit-down lunch. Join us for some family dining! Out takeout restaurants are also located near the campus of Florida State University and are the perfect location for a change from the cafeteria. Takeout is available for those on the go. 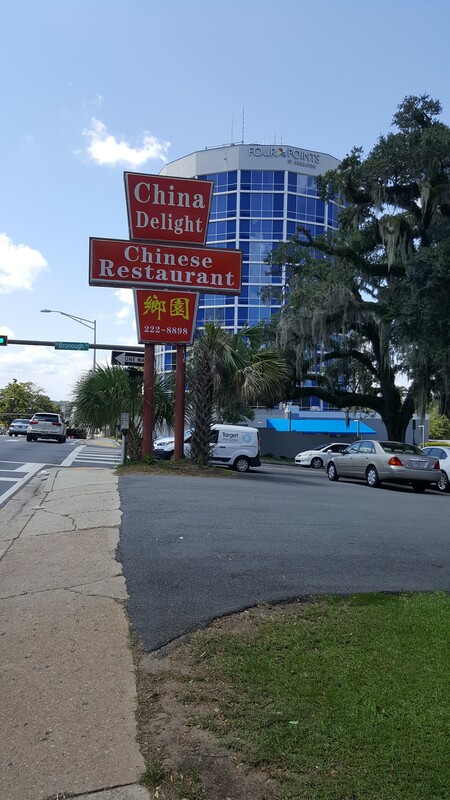 China Delight has been able to provide the residents of Tallahassee, FL, becoming one of the most sought-after family dining spots for authentic Chinese food. We believe that it's families that support us and ground us in what truly matters. We strive to be the perfect restaurant for every occasion. Whether you’re looking to grab some quick lunch with a friend or for a place for some family, make sure you visit China Delight today. If you are craving authentic Chinese food, there is no other place than China Delight Restaurant offering the best of this cuisine. We are the perfect place for family dining and also offer takeout service. We have various options - both vegetarian and non-vegetarian - for everyone on our menu. All our meals are prepared using fresh ingredients and traditional Chinese flavors. If you are in Tallahassee, FL, be sure to visit our restaurant for an amazing family dining experience. Visit us today! We are located on the corner of W. Tennessee St. and Bronough. 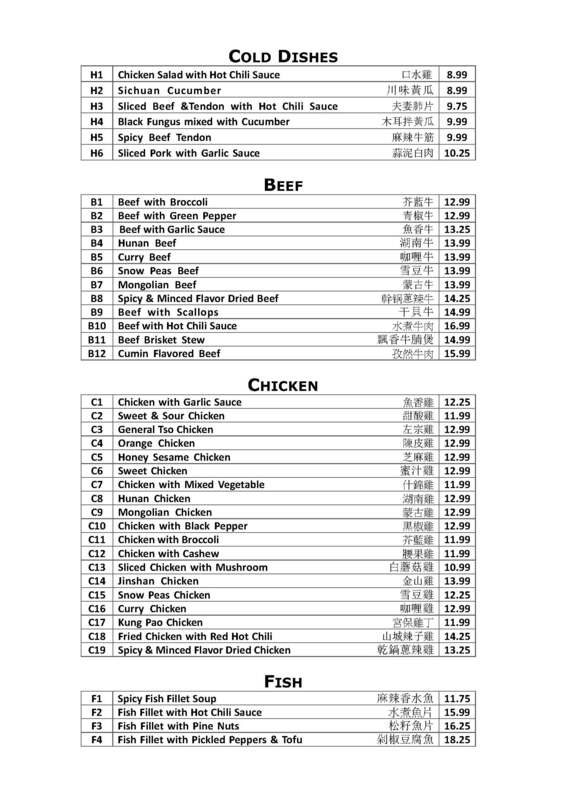 Poultry, Seafood, Dim Sum, Soups, Chow Mein & Lo Mein, Pork, Fried Rice, Beef, Soft Drinks, Coffee, Hot Tea.